It is time for the 5th Annual 5 Minutes for Mom﻿ Ultimate Blog Party. As usual, I'm a bit tardy to the party, but it goes through April 8! It's not too late for you to join either! If you're new to Only Parent Chronicles via the Ultimate Blog Party ~ Welcome! I'm so happy you decided to stop by! I am Kristin. I am a widowed mom of two tweens. We have been a three-man team since my husband's death in 2001. Hence the name Only Parent Chronicles. You can learn all about how I became an only parent HERE. I don't exactly put myself into a specific niche. I write about life as mom and life as a single woman. The last 10 years of motherhood has definitely challenged my identity as a woman. Here I write about how I work to still be Kristin while I do my best as Mom. Each Tuesday, I am the host Post-It Note Tuesday, a popular blog carnival that allows to to get your thoughts out in post-it form! I encourage you to come on back and link up! I also do a weekly feature (although, I have been slacking a bit) called Future Ex-Husbands. This feature appeases my inner-teenager. There is no such thing as too much eye candy, in my opinion! I'm a Twitter junkie. You can find me there as @Kristin_OPC. 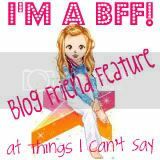 You can also mingle with me via Facebook or Blog Frog. It's as easy as clicking the links to the right, under my picture! I am so excited for the chance to meet some new and exciting bloggers! Please leave a comment to let me know you stopped by! Also, feel free to leave a link to your #UBP11 post in your comment! I'd love to pay you a visit! Stopping by from the party! Love the post it idea! I am going to do this! If only I knew how to get the little post it images into my blog :) any pointers? I am new at this! Hi! I'm stopping by from the UBP! I love meeting new bloggers so stop by and visit if you get the chance! I'm your newest follower and following on Twitter and FB too! Stopping by from UBP !!! 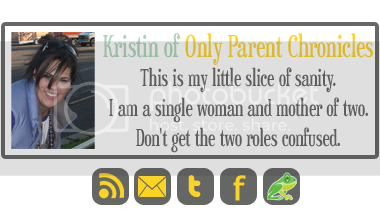 As a single parent I look forward to following your blog. We would love for you to come check out our fresh recently launched mommy blog and if you like what you see would love to have you as a follower. I hope that you are having an amazing week :O) !!! I have two blogs, and I’d love for you to stop by when you get a minute. We’re giving away a $100 Visa gift card at Giveaway Corner. Thanks!